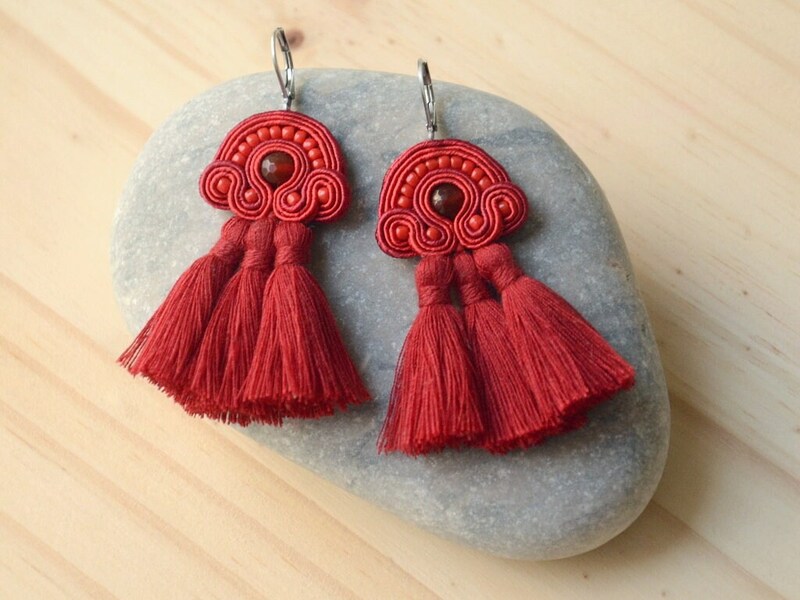 Red handmade earrings with tassels. I created these earrings using agate beads and the soutache braid. Unique and eye-catching, these earrings are a perfect add-on to a summer outfit. The earrings are ultra-lightweight, you'll forget you're wearing them. My products are protected from getting dirty and from damp by a special agent. I ship worldwide through a mail with tracking. Note that the colors of materials visible on the images may be slightly different from the original ones depending on the display unit you are using. Absolutes Highlight, tolle funkelnde "Steine", sehr leicht zu tragen und machen einen sehr schönen Eindruck! Kann ich jedem weiterempfehlen. Diese Ohrringe sind als Geschenk super angekommen. Passen perfekt für Sommerparties. Die Abwicklung war wie immer schnell und unkompliziert! Ganz bestimmt nicht die letzte Bestellung. Endlich mal ausgefallene und tolles Konzept für Brautschmuck. Ich kann es kaum erwaten die Ohrringe bald auf meiner eigenen Hochzeit zu tragen. No, JOASOU earrings are very lightweight. My jewelry is mostly made of fabric, so even if the earrings contain natural stones or Swarovski crystals, they are much lighter than the earrings made of metals. Avoid contact with make up and chemicals. For removing stains such as traces of make up foundation, I recommend using a cotton pad soaked in micellar water. Remove the jewelry when sleeping or exercising. Store in a closed box.